It’s not every day you receive compliments about your cooking from Michelin star chef turned national treasure, Tom Kerridge, but that’s what happened to one Brighton-based food producer when she appeared on the BBC’s Top of the Shop last year. “I went into the show with no expectations, just a desire to experience it,” says Liz Wakefield, who runs Sussex Gourmand from a converted workman’s store attached to the side of her home. Originally a private events co-ordinator at London’s Olympia, Liz now runs a marketing consultancy by day with Sussex Gourmand feeding her “creative, foodie passion” whenever time allows. Founded in 2017, it combines Liz’s love of bresaola, the cured meat-style that originates from Italy, her appreciation for the Sussex landscape, and her penchant for grazing on good food and quaffing wine. As you might expect, the onus of Sussex Gourmand is on quality and provenance. “I source beef from my local butcher, Barfields,” says Liz. “The meat comes from Saddlescombe Farm on the South Downs, which is owned by the National Trust and farmed by a wonderful couple who have high standards of animal welfare and environmental responsibility. 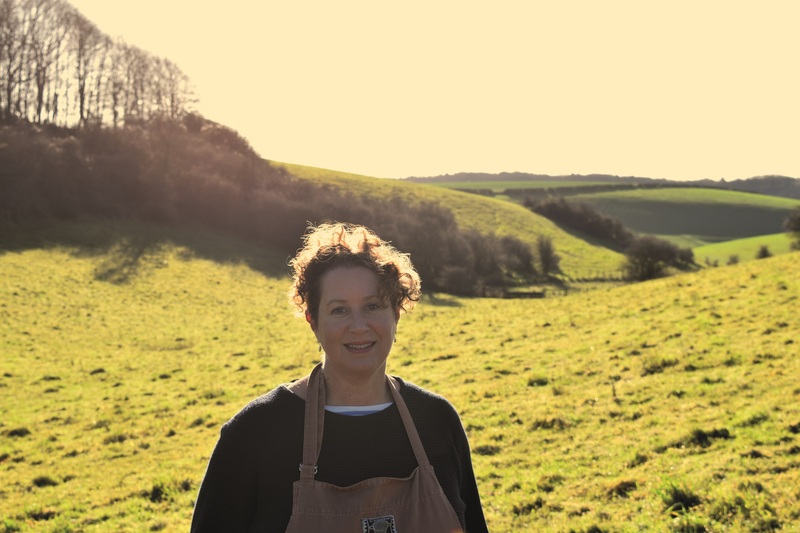 Having cooked meals for her family since she was a youngster, originally inspired by holidays in France, Liz now creates Sussex Gourmand’s bresaola in her home pantry and curing chambers, as well as handmaking canapé kits and curating gift boxes. “Bresaola is a super high protein, low fat snack, which can be enjoyed on its own, but I love the flavour combos of the kits,” she says. “I created them to reflect the countryside in which the animal grows up. When you look at the South Downs and see cows and sheep grazing, you think of milk, cheese and lush vegetation. The traditional serving of bresaola in Italy is on a bed of rocket with parmesan shavings on top, so my field canapé kit makes total sense. “The forest canapé kit is all about where deer roam. Forest mushroom thins, roasted beetroot ketchup and the delicious venison bresaola. Earthy but elegant flavours. Liz’s hampers, meanwhile, are a true labour of love and a local foodie education in their own right. That attention to detail has attracted national acclaim, with a number of Great Taste Awards already lining the mantelpiece – but inspiration always starts at home. “We love being based in Sussex as you meet people who really value good food,” says Liz. From field to fork, Sussex Gourmand captures the joy of rural life in the South Downs and packages it perfectly for the modern food and drink lover. Based in Brighton, Sussex Gourmand has cornered the market for artisan cured meats which are complemented with condiments highlighting the depth of flavours ever present in the surrounding fields and forests. Available to view and taste at farmers' markets, artisan shops and online, Sussex Gourmand also caters for parties.